Today's big news is not an update to the game, but a new launcher. 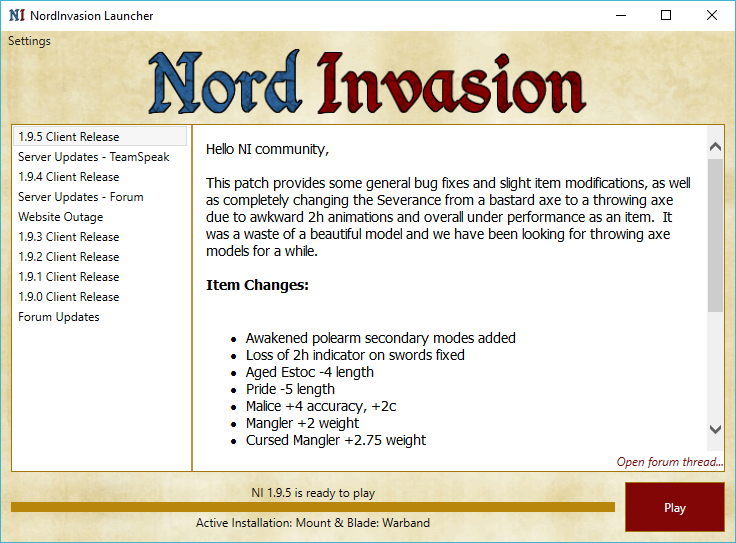 Today we are releasing the NordInvasion Launcher. In short, this launcher has been completely rebuilt from the ground up to give you a better experience and replaces the previous updaters. Much faster launching, checking and downloading. Threaded checks and downloads (max 20 threads - if your internet can handle it!). Supports multiple installations and NI betas - will automatically add any it can find (or just click the big button). Supports module folders with names other than "NordInvasion". Displays the latest NI News in the launcher and links the forum thread. Launches the game (both steam and non-steam). Selects the NordInvasion module (or whatever you named the module) on the Warband launcher when you click "Play". Automatically verifies & updates the module files (enable/disable as you wish). Installs like a normal program. Finally feels like a LAUNCHER rather than just an updater. Runs as a normal user rather than administrator and will elevate only if it needs to do something as administrator. The UI is more responsive that some of the previous updaters. All windows can be resized. We strongly advise you move to this new version - we will likely look at disabling some of the older updaters at some point. The updater will not remove any older updaters you have installed just in case you should have some issues. If you have any issues, please file a bug report here. The new launcher is available on the download page. We hope you love this new launcher! looking to use it soon! I have difficulty using this as windows wont allow me to open it. (08-04-2018, 09:27 AM)oracolus Wrote: I have difficulty using this as windows wont allow me to open it. When you first run the launcher, you might run into warnings. Click "More info" and "Run anyway". Let me know if the issues persist. I tried running it and got an error called "Shell error". Sadly the error message wont show up any longer when i use the ExE. It persist that i dont have the right credentials to open it even though i am the administrator. Which file are you running? Is it the installer (ni_updater_3.1.1.exe) or have you installed it and are now trying to run it (C:\Program Files (x86)\NordInvasion Launcher\NordInvasion_Launcher.exe)? Edit: Never mind, i managed to fix the issue. I opened it as soon as the download finished rather than saving it to my computer. Just to make it a little easier for us none steam users, as i assume that the auto find only works for steam installations as it isn't working for my GoG Version. Not going to lie, i had to randomly click area's to find this add manually link. NOTE: Also having issues Adding a path to my Warband.exe, not sure whether this is just on the GoG version or not so i'm having to only use this launcher for updating whereas i use the Default MB Launcher to open the game. Current time: 18-04-2019, 08:48 PM Powered By MyBB, © 2002-2019 MyBB Group. Design by Aldexy. Edited by Xen.